Photo Cataloging Case Study: A family lost their mother, who was the family historian. There were boxes and boxes of historical documents and paper photos the children did not want to lose. Several of the children lived in different states. I was hired to scan, name and organize all of the family history and photos. The completed project was uploaded to the client’s cloud storage site where other family members could enjoy them and add names and dates. Additionally multiple flash drives were created to hand off to each sibling for their own use. The family is delighted to have maintained their family history and now have the ability to expand on their archive. At the passing of the family matriarch, I was hired to digitize many paper photos from the 1900’s for a funeral service. They were delighted to be able to share these precious family memories with friend and family. Take care of yourself…your family…and what you have! Save your precious family photos today. 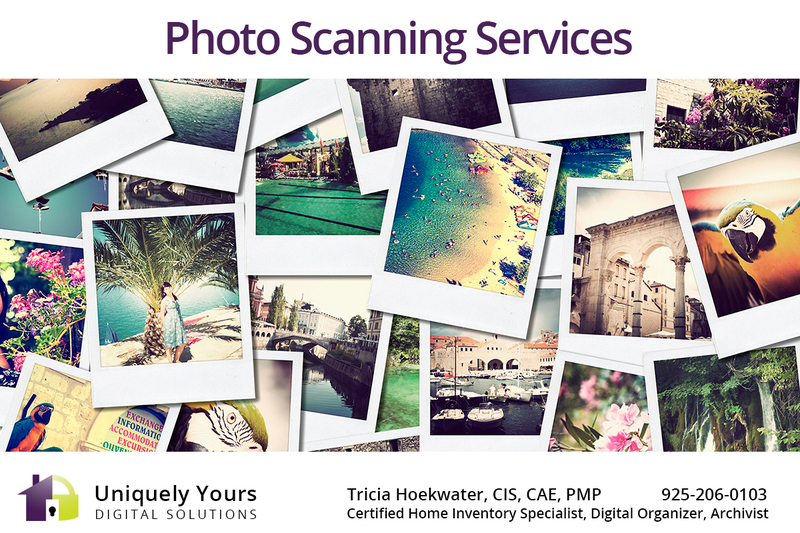 Contact Tricia via phone at 925-206-0103 or by email: uniquelyyours@outlook.com to discuss your photo scanning projects today.